Alphin, H. C., Lavine, J., & Chan, R. Y. (in press). Exploring the future of accessibility in higher education. Hershey, PA: IGI Global. Rumbley, L., Altbach, P. G., Stanfield, D. A., Shimmi, Y., Gayardon, A., & Chan, R. Y. (2014). 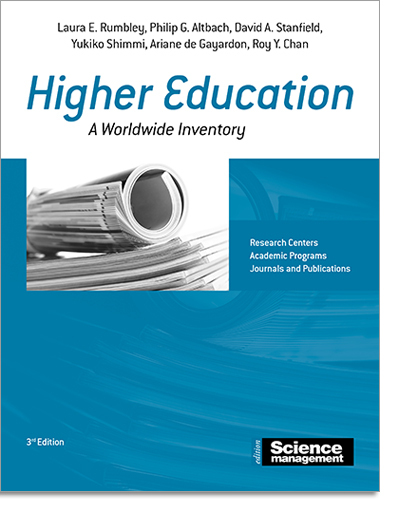 Higher Education: A Worldwide Inventory of Research Centers, Academic Programs, and Journals and Publications (3rd Eds.). Bonn, Germany: Lemmens Media Publisher. Chan, R. Y., Tang, H. H., & Delaney, P. (forthcoming). The rise of private tutoring: Contemporary issues in ‘shadow education’ in Mainland China. In Bartram, B., Education – International and Comparative Perspectives, London, UK: Routledge Education Studies. Chan, R. Y. (2016). Studying philanthropy and fundraising in higher education: A proposed conceptual model. In Alphin, H. C., Lavine, J., Stark, S. & Hocker, A., Facilitating Higher Education Growth through Fundraising and Philanthropy, Hershey, PA: IGI Global. Chan, R. Y. (2014). Can China keep rising in the age of globalization? : Chinese students’ learning and living experience at two “World-Class” research universities in East Asia. International Journal of Chinese Education, 3(1), 74-108. Chan, R. Y. (2014, Fall). “The role of young alumni in closing the graduation gap in higher education.” Washington, D.C.: Center for Public Justice – Capital Commentary. Chan, R. Y. (2014, Spring). “The Future of Community Colleges: Reinvesting in Remedial Education Programs.” Washington, D.C.: SharedJustice [April 8, 2014]. Macfarlane, B. & Chan, R. Y. (2014). The last judgment: Exploring intellectual leadership in higher education through academic obituaries. Studies in Higher Education, 39(2), 294-306. Chan, R. Y. (2012). The effects of college environment on students’ learning and living experience at a world-class university: A comparative case study of the University of Hong Kong and Shanghai Jiao Tong University. The International Journal of Comparative Education and Development, 14(1), 87-98, ISSN 1992-4283.